There are 2 types of stabilizers in every joint: Dynamic and Static stabilizers. This is a good description of the Static stabilizers of the knee joint. Can one have mobility without stability? Are they one in the same? Are they even related? If so, how? Firstly, Functionality should be the priority. Every joint in the body has an inherent functional physiological range of motion (ROM). This means that all joints, based on anatomy can move (some more than others) in certain directions with stability. In other words they have mobility with stability. So to answer the above questions: Yes! Stability and mobility are very much related and more so, mobility is dependent on stability! The problem comes in as life happens. As life happens we incur injuries (car accidents, sports injuries, etc.) that effect the stability, mobility or both in a negative way. This in turn negatively effects the inherent ROM of one or more joints. For the lucky ones its only one joint and it fails to effect the rest of the body through the kinetic chain, rarely this is the case. For most of us these injuries effect the functional stability of the rest of the body through compensatory patterns. Loss of stability in a joint causes decrease in mobility, when that happens the joints on either side are forced to compensate by increasing their mobility which usually results in decreased stability for the entire system. Which can explain that sudden pain in the shoulder or low back that you can't explain. The Rotator Cuff is a great example of the dynamic stabilizers of the shoulder. So what do i do? Well, chiropractic adjustments is a good start. But be careful, not all chiropractors are created equally! Some are less diligent than others, Medical doctors are no different, every trade has its bad seeds! Your chiropractor should be looking to mobilize the stuck joints and stabilize the hypermobile joints. What does that mean? That means that for the joints (spine or extremities alike) that are moving without stability (hyperflexible ankles from recurrent sprains) there should be exercises to strengthen the ankles dynamic stabilizers to prevent further sprains. For the fixated joints (joints that are stuck in one position like that crick in your neck some mornings) they should be adjusting them to increase mobility. This will indirectly reduce the strain on adjacent joints and halt premature degeneration of all joints involved! 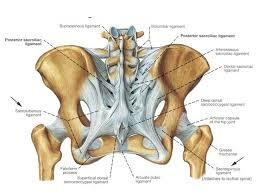 The pelvis is a very tightly bound complex of ligaments and bones. All of which are responsible for static stabilization. Home exercises should also be part of your care. This is how you reprogram the system so that you increase muscular control of joints, increasing stability. If your chiropractor isn't giving you exercises you should be asking for something! At the end the day when it comes to adjustments always keep this in mind: If it's stuck, mobilize it and if it hypermobile stabilize it! If you have any questions please feel free to ask me through email or come on in for a free 15 minute consult and I'll be happy to answer any questions you may have.